Dovey Valley Cottage01654 700603work Self-cateringDovey Valley Cottage is a cosy holiday cottage nestled on the bank of the river Dulas near Machynlleth, and within easy reach of Aberdovey, Dolgellau, Barmouth, Tywyn, Aberystwyth, Ynys Hir and Cadair Idris. The holiday cottage is ideally located for the coast and beaches, golf courses, beautiful walks, the RSPB nature reserve Ynis-Hir and mountain biking at Machynlleth and Coed-y-Brenin. Dovey Valley Cottage comprises Ground Floor: Entrance into the comfortable and spacious open plan kitchen, dining and sitting room with beamed ceiling. The kitchen has an electric oven and hob, fridge, microwave and coffee machine. The dining area has a dining table with 4 chairs. The very comfy sitting area has a wood burning stove and is furnished with a large squishy sofa, armchair, TV, DVD and CD players. First Floor: There are two bedrooms, one with a double bed and one with 2 single beds, plus a shower room and WC. Garden and Parking: There is a lovely garden in front of the cottage which has a lawned area that slopes gently toward the bank of the river, where a bench is provided so that you can enjoy the scenic view. A barbecue and table and chairs are also provided, and there is parking for one car on the drive. More can be made available. Other Information: There is central heating throughout the cottage; this is charged at a flat rate of £25 per week between October and April inclusive. One complimentary basket of logs is provided - more are available to purchase locally. A travel cot and stair gate can be provided. There is no washing machine but a return laundry service is available. A welcome pack and free WiFi are provided. No smoking. Sorry, no pets. Nestled on a rocky bank of the river Dulas, our holiday cottage is cosy enough that you might not want to venture out but if you do there is plenty to see and do. Aberdovey, Dolgellau, Barmouth, Tywyn, Aberystwyth, Ynys Hir and Cadair Idris all within a 40minute drive, and the Centre for Alternative Technology is close by. This beautiful area is a perfect base for exploring, fun at the beach, walking, mountain biking and golf. The RSPB Nature Reserve is at Ynys-Hir. Beaches at Aberdovey and Barmouth, and Golf at Aberdovey. The historic town of Machynlleth is one of 8 mountain bike bases in Wales. We are 30 mins from Coed-y-Brenin Mountain Bike Centre and Go Ape. The natural Mach MTB Trails ranging from blue to black wind through the hilly countryside surrounding Machynlleth. The purpose built Cli-machx, 1.5 miles from the cottage features rocky jumps and the longest descent in Wales. The cottage has facilities for MTB storage, outdoor hose for washing bikes and an area for drying wet clothes and equipment. We can provide packed lunches for walkers and bikers, local trail and OS maps, up to date weather forecast and other info. Bike hire is available in Dolgellau . 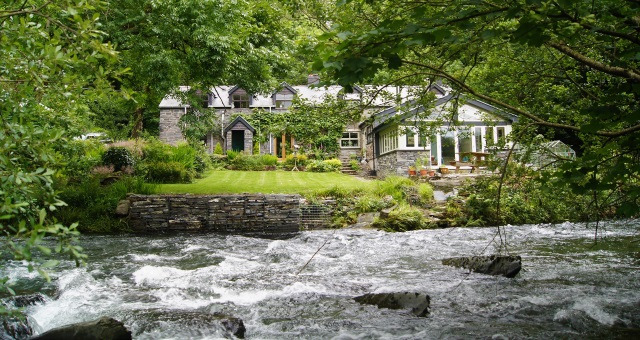 Dovey Valley Cottage is a cosy holiday cottage nestled on the bank of the river Dulas near Machynlleth, and within easy reach of Aberdovey, Dolgellau, Barmouth, Tywyn, Aberystwyth, Ynys Hir and Cadair Idris. Please note: River has no safety barriers, guests with small children need to be aware of the possible risks. Children welcome from any age. By Car: Travelling from the A487 Machynlleth to Dolgellau road. If travelling from Machynlleth the Centre for Alternative Technology (CAT) will be on your right and if from Dolgellau on your left. Take the turning for CAT, drive over the unusual shaped bridge. Turn right just before the entrance for CAT. The lane is signposted for overflow parking. 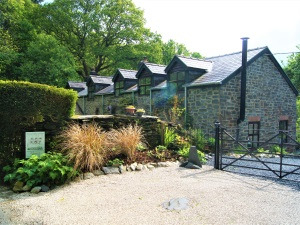 Just past the entrance for the car park there is a large slate wall - Minafon is the next cottage on your right. Please park inside the gates and Dovey Valley Cottage is on your left. Mrs. Davies will meet you with the key. Unfortunately because of the position and age of the property it is difficult to recommend it to anyone with disabilities. There is a flight of stairs to the bedrooms and bathrooms which may be a problem. Please call the owner with any questions to get a clear picture of the accessibility.